Before we are digging in on today’s dish, can I just take five seconds and tell you how much I love my daughter. One week ago Elsa turned two. And it got me thinking. I never ever expected parenting to be this much fun. But it is! She is just super hilarious and completely amazing all the time. And the hugs she gives. So utterly honest and full of love. Just needed to say that. Now on to the food. Hopefully we only have a few more days of winter left. 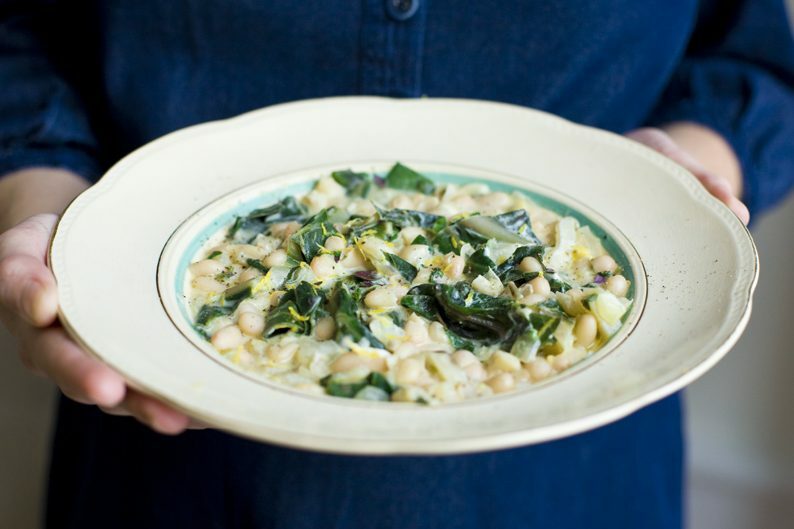 But we still wanted to give you one last comforting recipe before moving on to spring food. This stew is something that has kept us going through the dark and cold Swedish winter. 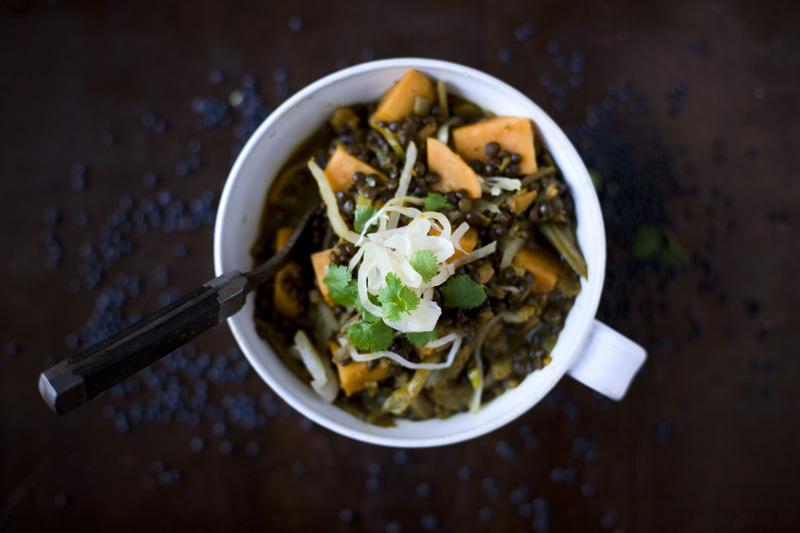 Warm spices, tender sweet potato, chewy black beluga lentils, shaved fennel, a dollop honey and a few tablespoons of sauerkraut. Yes, this dish is probably as comforting as it gets. It’s like one of Elsa’s hugs. Warm and soft and full of life. 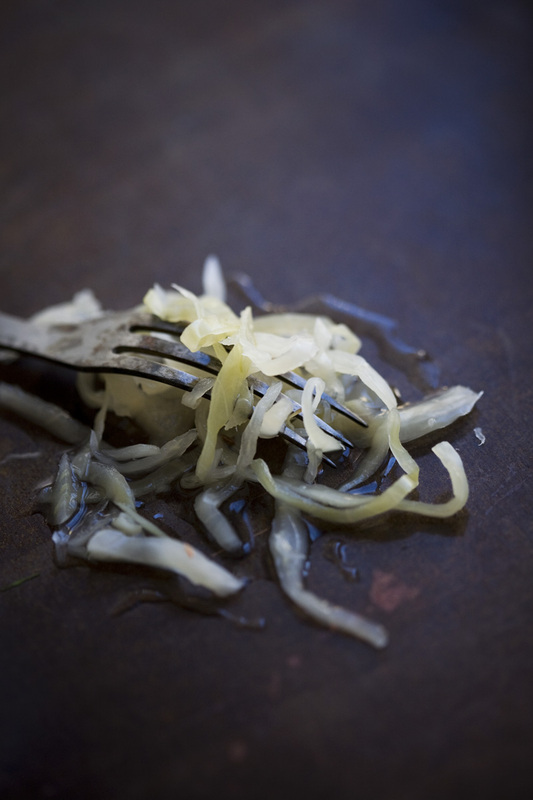 If you haven’t tried sauerkraut before, we urge you to give it a try. This fermented finely shredded cabbage – similar to the Korean kimchi, but less spicy – is not only super healthy, but it also gives a fresh twang to whatever you mix it with. In our recipe it works especially good because we both have honey and sweet potatoes that balance the sourness from the sauerkraut. You can make your own sauerkraut. It is not that complicated, but it takes a while to get the whole fermentation thing going. So if you plan on making this dish sometime this month, you might want to pick up a jar from your supermarket or health store. I spent the autumn experimenting with my own kimchi recipe. I still have a few jars in our fridge, but after a few months in there I am afraid to open it, thinking it might talk back to me. If you don’t want the lentils to color the rest of the stew you could also cook them separately (as we have done in the photo above), and then add them to the stew together with the sauerkraut and the honey. But the most nutritious way is to cook everything together. 1. Melt ghee, coconut or olive oil in a thick-bottomed pot on medium heat. 2. Add cumin, turmeric, cardamom, cilantro and cayenne. Stir constantly to prevent it from burning. 3. When the spices smell fragrant, add ginger, garlic and onions and cook for about 3–5 minutes. Add a little water if it is to dry. 4. Add sweet potatoes and fennel and stir for a couple of minutes. Meanwhile rinse and drain the lentils. 5. Add lentils and water, cover and let simmer for 30 minutes or until the lentils are cooked. 6. Add sauerkraut and honey. Season to taste with salt & pepper. 7. Serve in bowls and top with sauerkraut and fresh herbs. So excited about this recipe! I'm totally into beans and lentils lately so this would be perfect. Have to make it and tell you how it turned out. Thanks, let us know how it turned out! 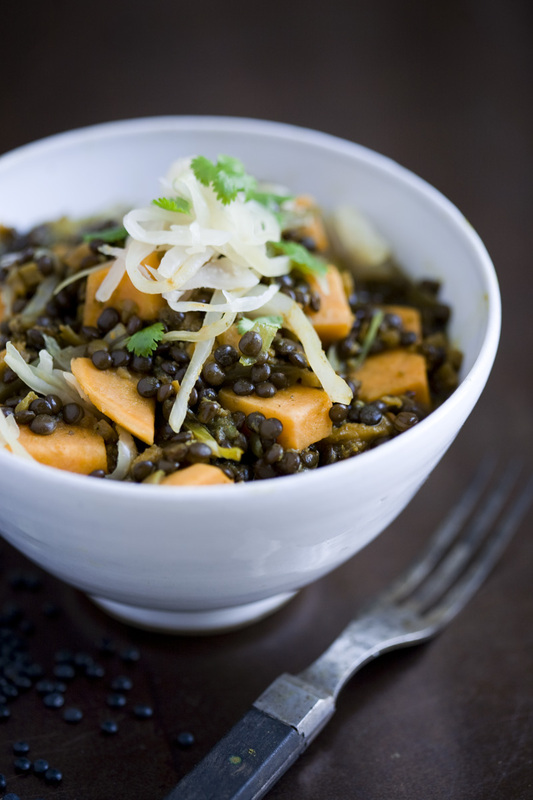 I like how you've balanced the earthiness of lentils with the freshness of fennel, creamy sweet potato, and tangy sauerkraut. 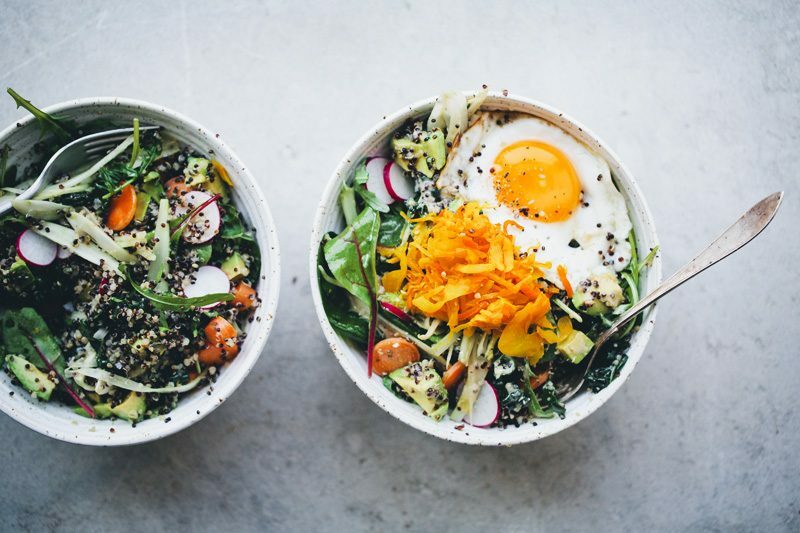 Such a beautiful and nourishing dish! 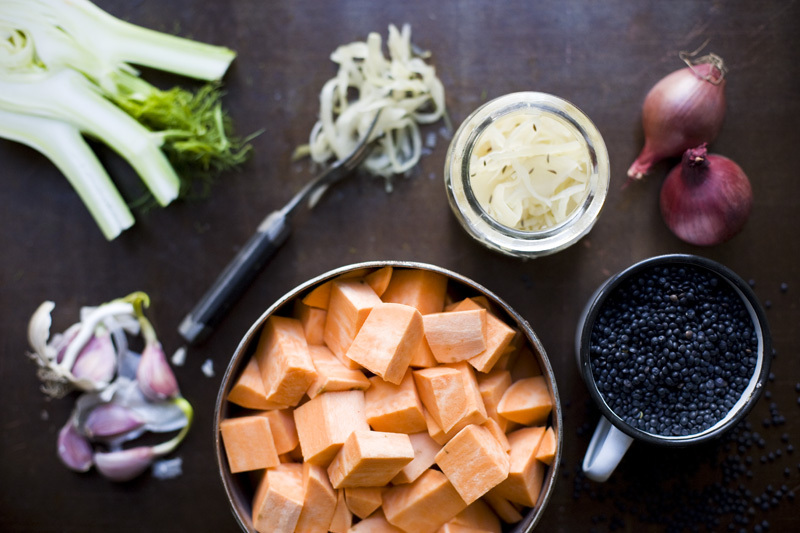 I love adding sauerkraut to lentil soup so I'll definitely be giving this recipe a try. For anyone who has never made it at home, fermenting sauerkraut is surprisingly easy and really fun. Plus, it tastes SO much better than store-bought! Looks so good! I think it is really tasty!! What a gorgeous dish! I've never used or heard of Beluga Lentils. I hope they sell them in the United States because I would love to try this recipe! I'm not much of a fan of sauerkraut (I don't like vinegar very much!) but I may be able to try a little with this stew! You can use other kind of lentils as well, we have made it with red and yellow lentils several times, so good too, but different! Hope you'll find a good quality sauerkraut, definitely worth it! Stew filled with LOVE! The true art of making food to nourish :) Love that. The feeling of love from your daughter is as close as I can get to expressing my gratitude to you for sharing your wonderful cooking skills, nutritional advice and photography here on the blog. 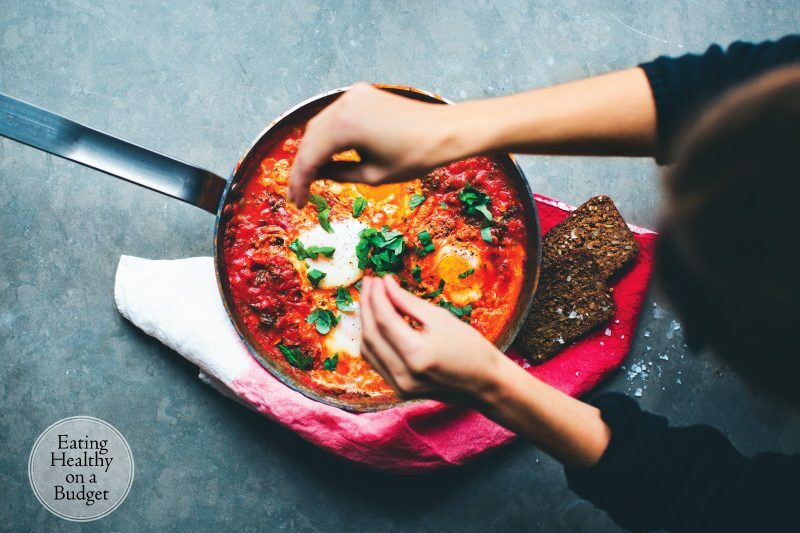 For years I read blogs that omitted one or two ingredients that I couldn't/wouldn't eat, but never found any that met all my needs and also my desire to eat really well. The internet is full of people showing you how to make an allergy fee approximation of sugar, fat and salt filled foods. I didn't wanted that. 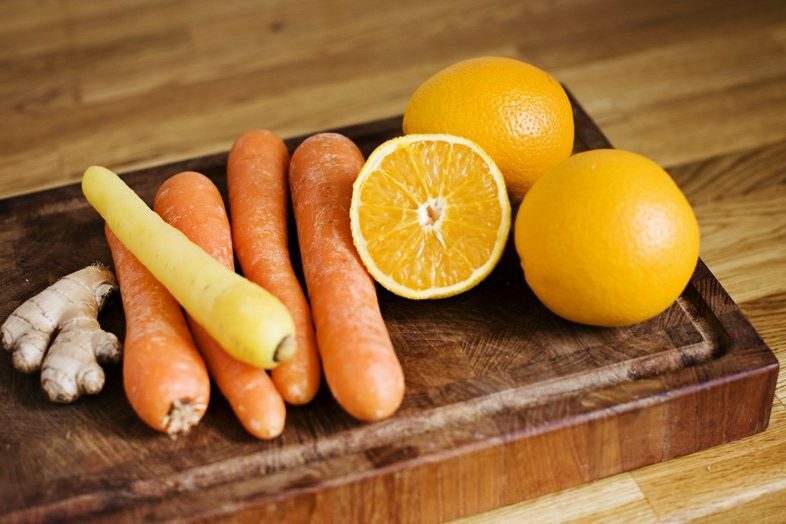 I wanted fresh, healthy, often raw, nutrition packed, wild and most of all, flavourful food. You offer all of that and with same spirit of experimentation that I use when preparing food. Thank you so much for everything you share. I am encouraged every week by something you have written and my life and health are both better as a result. Cally! Thanks a million for your beautiful comment! Keep coming back ;-) & thanks for reading! thanks Elenore! I know that joy haha :-) Happy cooking! I have been looking for beluga all over this country. I love whole masor dal (brown lentils) so much, I know beluga will be even better. We don't have spring but do enjoy spring like weather for couple of days before the summer comes calling, and I don't look forward to the desert summer. Not a bit. Food is the only way i survive it. Such wonderful flavors in this bowl. Another winner here! Your little girl is so adorable. You can tell she gives the best hugs :) I love cooking with beluga lentils - I even like the way the little dry ones feel in my hands! Can't wait to try this one. 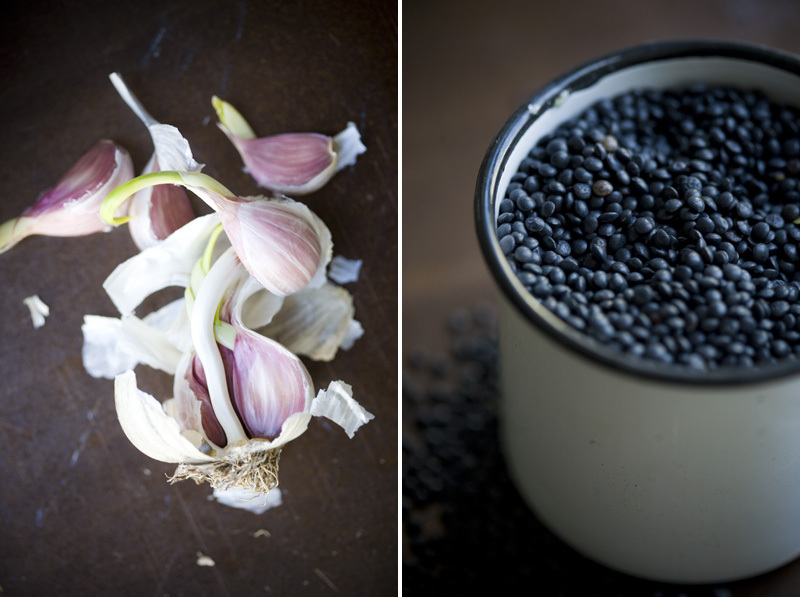 i love beluga lentils. this stew is definitely something i would enjoy and i need to take the time to make it- SOON! Mmm what a lovely stew! So full of flavour and deliciousness. Such a fresh looking stew - almost looks like a salad! That stew sounds incredible. And I love love love your pics. I love sauerkraut! My mom used to use it with recipes all the time. This past week I had a cold and I ate so much sauerkraut!